I recently bought a Nuvi 2515 LM. It didn't come with a wall charger only a USB cable; so, the only way to charge the device is through the USB port in the car or computer. Both, make the unit go into data transfer mode, so the device cannot be used while driving. Can anyone help? Where did you buy it? It should come with a 12v lead for use in the car, other leads often (as you've found) won't work. I went into a truck stop that deals with long haul truckers... they LIVE by their GPS. He pointed me to a Car adapter that was $9.99 and the specs were: Mini USB output: 4.75V-5.25V/2A. Works perfect. I have a Nuvi 710 - I think the specs are what makes or breaks the charging and continuous use as most generic chargers max out at 3v/1200mA. 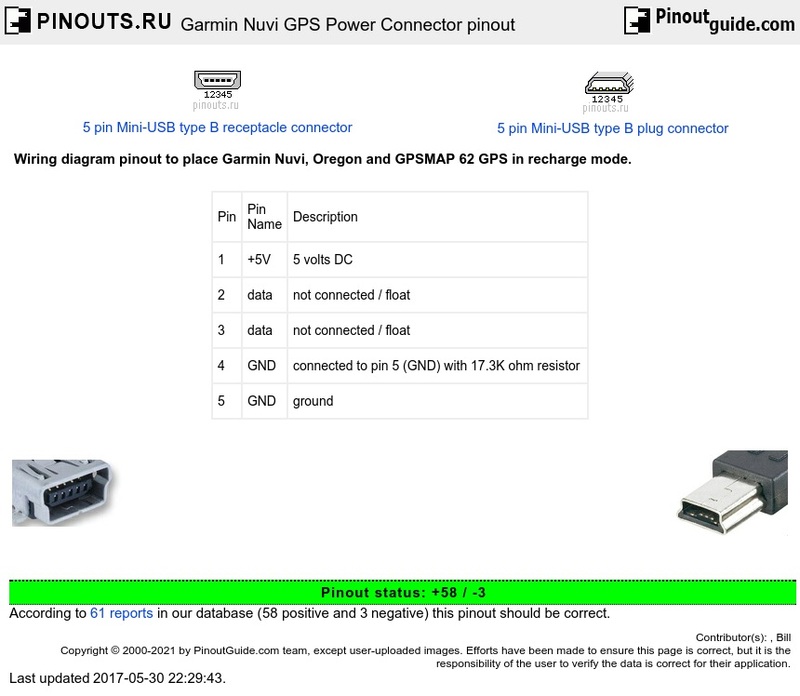 Can I use an adapter for using the garmin 2589 in cigarette lighter and one to charge my cell phone at the same time? Hi Everyone I had the same issue with trying to use our NUVI with a standard USB car-charger... after trawling the internet, I found the link below, which explains the USB cable requirements that Garmin have introduced to ensure that we all use their own power adapter ONLY... if you modify your cable as described, or buy one that is already set-up as such then you will find that there are no problems with the voltage of your car's battery I think... I measured the output from my 5A USB adapter & found it to be 5.1v, so plenty to run the NUVI appropriately, yet it was still being forced into PC connectivity mode! Hopefully this can be of assistance to others too? There are so many issues associated with USB charging adapters and cables that it is almost a trade course on its own. Pinouts, cross connections and there is a difference between a UBD power supplies to provide a constant stable 5V with 0.5A, 0.7A, 1A, 2A and ones that can provide enough voltage/current to charge a battery in a specified time. I have read as high as 9v on the USB feed when charging a rechargeable device. Many device manufacturers make their cables to identify when charging is intended vs simple operation and loads on a USB socket are so variable especially when an LCD screen is either on or off, yet lithium batteries need tight controls on charging at risk of explosion. These are the array of reasons manufacturers encourage the use of their dedicated power supplies and the constant discussion on how you can do it cheaper only maintains the air of frustration.